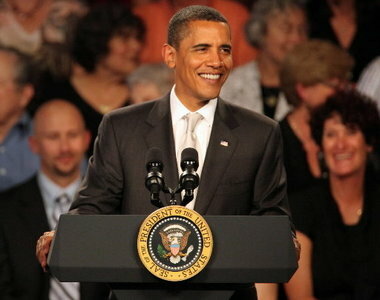 President Barack Obama pitches his health care plan at Shaker Heights High School in this July 2009 file photo. The Democratic incumbent will return to the school Wednesday to talk about the economy, and it’s likely he won’t bring the same congressional salesmanship he offered the last time he visited. SHAKER HEIGHTS, Ohio — When he came to Shaker Heights High School in July 2009, full of first-year optimism and salesmanship, President Barack Obama called on Congress to work with him on an overhaul of the nation’s health care system. When he returns Wednesday afternoon, expect a different tone. The Cleveland-area visit, which the White House bills as remarks on the economy, is likely to present Obama in a new, election-year narrative. Where he once sought compromise, Obama now aims to distance himself from a Congress with historically low approval ratings. “In terms of the president’s relationship with Congress in 2012 . . . the president is no longer tied to Washington, D.C.,” a deputy press secretary told reporters for the New York Times and Washington Post during a briefing in Hawaii, where Obama was vacationing last week. Signs of the shift became apparent before Christmas when the Democratic-controlled Senate approved a two-month extension of a payroll tax cut set to expire Jan. 1. House Republicans, led by Speaker John Boehner of Ohio, balked at the deal and called for a full-year extension. With senators already on holiday recess, Obama and fellow Democrats cast the Republicans’ unwillingness to forge a short-term deal as a willingness to raise taxes. On Dec. 22, the House GOP agreed to the two-month extension, handing a political victory to the president. Further elevating the political stakes of Wednesday’s speech is the fact Obama will deliver it hours after the Iowa caucuses, the first Republican presidential nominating contest. Obama is scheduled to speak at 1:15 p.m. Beginning at 6 p.m. Tuesday, free tickets will be available on a first-come, first-served basis at the school district’s administration building on Parkland Drive. 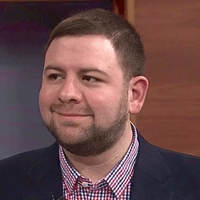 Ohio, which holds its primary March 6, remains a state key to winning in November; the Shaker Heights visit will be Obama’s 16th to the Buckeye State since taking office in January 2009. Yet Obama’s poll numbers show he has a challenge ahead. In a Quinnipiac University survey last month, 55 percent of Ohioans disapproved of the president’s job performance. Obama won here by four points in 2008 and saw promising signs last fall after a Democratic-backed coalition led the repeal of a labor law championed by Republican Gov. John Kasich. A week after the measure went down, Obama’s re-election campaign sent Vice President Joe Biden to Euclid to celebrate with firefighters and other unionized public employees. But Republicans were equally encouraged by last fall’s vote on Issue 3, which delivered a strong rebuke to Obama’s health care plan and passed by a greater margin than the labor law failed. On Monday, upon hearing where Obama would speak Wednesday, those Republicans were quick to recall what he discussed the last time he visited Shaker Heights High School. WASHINGTON — A group of Wisconsin union officials has voted to ban Republican politicians from a local Labor Day parade, underscoring how partisan the state has become in the wake of this year’s clashes over collective bargaining rights. The Marathon County Central Labor Council, which sponsors the parade, includes some 30 local unions. Council President Randy Radtke said in a statement on the group’s website that politicians are only welcome at the festivities if they have demonstrated support for workers’ rights. In February, the 14 Democratic members of the Wisconsin state Senate left the state to deny their GOP colleagues a quorum and prevent them from pushing forward Gov. Scott Walker’s (R) controversial budget repair bill, which stripped most of the collective bargaining rights from public employees. Through a last-minute budgetary maneuver, Republicans were able to pass the measure. All but one GOP state senator voted for it. 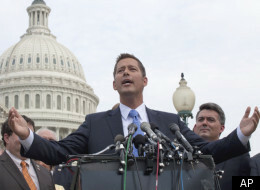 On the federal level, Rep. Sean Duffy (R-Wis.) represents Wausau. In a statement to local ABC affiliate WAOW, Duffy’s office decried the labor council vote. “Having walked in this parade in past years, Congressman Duffy was hoping that for a moment, we could set our differences aside and simply have some fun in a family-friendly event,” a Duffy spokesperson said. “[The congressman] walks in a lot of parades, and staff called to register a spot last week and was informed in colorful language that no Republicans were being allowed to participate this year,” added Duffy Chief of Staff Brandon Moody in an email to The Huffington Post. Other politicians who won’t be welcome at the parade include state Sen. Pam Galloway (R-Wausau) and state Rep. Jerry Petrowski (R-Marathon). This story was updated with additional comment from Duffy’s office. CORRECTION: An earlier version of this report incorrectly identified the broadcast network with which WAOW is affiliate. The station is an affiliate of ABC, not NBC. COLUMBUS, Ohio — Gov. John Kasich backtracked on Senate Bill 5 on Wednesday, asking union leaders to negotiate a compromise on the collective bargaining law he championed and end efforts to repeal it. While the Republican leader made clear he wants a voter referendum on SB5 to go away, Kasich did not specifically outline provisions of the multi-faceted law that he is willing to lose. Kasich held a news conference to publicly ask union leaders opposed to SB5 to meet with him and other Republican leaders at 10 a.m. Friday at his office building. He also put his request in writing, sending a letter to We Are Ohio, the anti-SB5 group. The governor didn’t have to wait long to get his answer. We Are Ohio spokeswoman Melissa Fazekas was waiting outside Kasich’s Statehouse office for the news conference to end. Her message to reporters was simple: It’s too late for talking. She noted that a record 1.3 million signatures were collected to get the repeal effort on the Nov. 8 ballot, and she questioned Kasich’s claim that voters are clamoring for a compromise. She called Kasich’s invitation to meet a publicity stunt to save political face over a law that polling suggests will be overturned by a wide margin. Fazekas said she could not say whether individual union leaders would accept the governor’s invitation and show up on Friday. But she said the official position of We Are Ohio is that Republicans, who control the legislature, should repeal the bill — and then union leaders would be willing to talk. “That would be a starting point for us,” she said. The hard-charging Kasich, who prides himself on never wilting to outside pressures, especially from media, said he yielded this time to editorials in The Columbus Dispatch and The Plain Dealer that called for the two sides to sit down and talk. 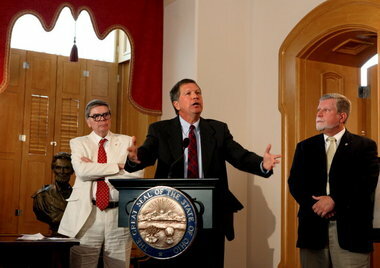 But many have wondered why the governor, who signed SB5 on March 31, took so long to publicly call for a compromise. Kasich says his timing has nothing to do with efforts to repeal the law, or with a recent Quinnipiac poll that shows the measure being defeated by a double-digit margin. “This is not an effort that is being put forward because we fear we’re going to lose,” Kasich said. The Quinnipiac poll, released in late July, showed voters favoring a repeal of SB5, 56-to-32-percent — a 24 point margin. The same poll, however, showed voters strongly support key aspects of the law, including requirements that public workers pay at least 15 percent of health insurance premiums and contribute at least 10 percent of their wages toward their pensions. Other media reports have made similar claims with anonymous sourcing. But Fazekas said no such discussions ever occurred between the two sides in any official capacity. And no union leader has come forward to admit participating in any such meetings. Batchelder, the GOP House speaker, is concerned that a volatile campaign this fall may be a setback for Ohio, which he said is showing signs of making economic improvements. Ohio Republican Party Chairman Kevin DeWine issued a statement late Wednesday urging labor leaders to put aside “political differences” and heed Kasich’s call to compromise. SB5 was a highly controversial bill that drew the most boisterous and intense rallies to the Statehouse earlier this year that anyone could recall. One rally attracted more than 8,000 people with signs and bullhorns who rallied on the Statehouse lawn. At one point, the Statehouse doors were locked to keep opponents out. Security was more than tripled. The events drew national media attention. Senate Bill 5 sharply restricts collective bargaining, ends binding arbitration and bans worker strikes for all state and local public employees. Kasich has said tools in the law will help local governments rein in the costs for salaries and benefits of their workers, paid for by taxpaying private sector workers. If it chooses to, We Are Ohio has until Aug. 29 to pull its referendum off the ballot. Kasich said if his offer to compromise is rebuffed, he is prepared to fight on toward November. WASHINGTON (AP) — About a dozen trade unions plan to sit out the 2012 Democratic convention because they’re angry that it’s being held in a right-to-work state and frustrated that Democrats haven’t done enough to create jobs. The move could pose a larger problem for President Barack Obama next year if an increasingly dispirited base of labor activists becomes so discouraged that it doesn’t get the rank-and-file to the polls in the usual strong numbers. The unions – all part of the AFL-CIO’s building and construction trades unit – told party officials this week they are gravely disappointed that labor was not consulted before Democrats settled on Charlotte, N.C., where there are no unionized hotels. “We find it troubling that the party so closely associated with basic human rights would choose a state with the lowest unionization rate in the country due to regressive policies aimed at diluting the power of workers,” Mark Ayers, president of the building trades unit, wrote in a letter to Democratic Chairwoman Debbie Wasserman Schultz. The decision by the building trades came after a vote by leaders of the unit’s 13 affiliate unions, including the Laborers, Painters and Electrical Workers unions. Overall, they represent about 2.5 million members. “We were thrilled to have the support of local labor leaders including the (state) AFL-CIO for Charlotte’s bid,” Roussell said. Despite the strong language in the letter, at least one of the 13 unions says it is still considering whether or not to go. “The Teamsters Union has not gone through our own internal decision process about the Democratic National Convention,” said spokeswoman Leigh Strope. Monroe said the decision doesn’t preclude individual members of the unions from running as delegates, and some of the unions apparently are still considering how to proceed. Many of the largest and most prominent unions, including the National Education Association and the Service Employees International Union, still plan to be active participants in the convention. And local labor leaders in North Carolina have praised the site choice. But the angst goes beyond the trade unions. The International Association of Machinists, which is not part of the building trades, said it has also decided to skip the convention after participating for decades. Monroe said the unions are being careful not to use the term “boycott” because they don’t want to damage Obama’s re-election prospects. He said money is also a major factor, when unions are spending millions trying to beat back efforts by Republican lawmakers to curb union rights in Wisconsin, Ohio and other states. “It would be disappointing to our members to see us doing business as usual, diverting resources that we know are scarce, when we should be laser-like focused on getting elected officials focused on the jobs agenda,” Monroe said. AFL-CIO President Richard Trumka warned earlier this year that unions would focus more of their energy and money on shoring up infrastructure in the states and less on boosting a single political party. In the past unions have donated millions of dollars for sky boxes and other sponsorships that usually help underwrite the convention. But this year, the Democratic National Convention Committee announced it would no longer accept contributions from lobbyists, corporations and political action committees, including unions. Individuals are limited to $100,000 in donations. The choice of North Carolina in February provoked immediate outrage among labor leaders, who said it was another indication that Democrats take union support for granted. But Democrats defended the decision, saying it’s part of party’s push to win crucial swing states in the South, including a state that Obama carried in 2008. Organized labor and Democrats had a similar squabble over the choice of Denver for the 2008 convention. That gathering was held at the nonunion Pepsi Center and Denver had few unionized hotels. At one point, Teamsters President James Hoffa threatened to “blow up” the convention with picketing and protests if union issues were not worked out. But the two sides ultimately struck a deal to staff the Pepsi Center with union employees. (AP) — Forty-five thousand Verizon workers from Massachusetts to Washington, D.C. are on strike as of midnight Sunday. Union workers walked the picket line in New York City, chanting and marching. They work for the company’s “wireline” division, and the strike does “not” affect Verizon Wireless. The group handles landline operations, installations, and internet lines. The Communication Workers of America called a strike after contract negotiations stalled. Health care and pension costs appear to be the biggest sticking points. A Verizon spokesman says workers want a contract that is “not reflective of the marketplace”, pointing out union employees do not pay toward their health care premiums. The contract expired at midnight. Washington (CNN) — The Senate passed legislation Friday temporarily restoring full funding to the Federal Aviation Administration, breaking a political impasse and allowing roughly 4,000 furloughed federal employees to return to work. Passage of the bill also promises to restore tens of thousands of jobs in the construction industry and elsewhere tied to airport improvement projects put on hold as a result of the funding shortfall. The bill took less than one minute to pass a nearly empty Senate chamber by a legislative maneuver known as “unanimous consent,” which allows as few as two senators to approve a bill as long as no objections are filed. Most members of Congress are currently away from Washington on their summer recess. The political differences which led to the funding shortfall, however, have not been resolved. Democrats and Republicans are still at sharp odds over whether to continue providing subsidies to smaller rural airports. The two parties also differ over whether to make it easier for airline employees to unionize. Congress will have to revisit the issue within six weeks in order to avoid another lapse in funding. Public outrage over Congress’s decision to adjourn for the summer without providing adequate funding for the approximately 4,000 employees contributed to the push for at least a short-term resolution. Transportation Secretary Ray LaHood repeatedly took to the airwaves over the past several days, cajoling lawmakers to come back from their break and reach an agreement. For workers facing the possibility of lost wages for weeks to come, news of the breakthrough evoked an emotional response. Evelyn Martinez, an FAA inspector, cried when she learned of the deal. Since authorization for FAA funding expired in late July, the agency has also been unable to collect federal taxes on airline tickets — leading to a revenue loss of approximately $30 million a day. If the dispute had continued until Congress returned in September, the federal government would have lost over $1 billion in revenue. Senate Majority Leader Harry Reid, D-Nevada, had been in talks this week with House Speaker John Boehner, R-Ohio, and administration officials about how to resolve the funding impasse, a Senate Democratic leadership aide told CNN. “But I believe we should keep Americans working while Congress settles its differences, and this agreement will do exactly that,” he said. The agreement is the 21st short-term funding extension for the FAA. The Republican-led House previously passed a short-term extension, but it included a number of changes opposed in the Democratic-controlled Senate. One of the changes involves involves language in the House bill that would reduce or kill subsidies to rural airports, specifically targeting some in Nevada, Montana and New Mexico — three states with influential Democratic senators. The Senate ultimately agreed to pass the House bill, but as part of Thursday’s agreement, LaHood will notify congressional leaders that he has the authority to grant waivers to affected community airports, which would exempt them from the subsidy cuts. While no specific exemptions are required, LaHood’s authority gives Democrats the assurance that the disputed language they opposed can be overridden, the leadership aide noted. A larger dispute regarding the unionization of airline workers has not been addressed at all, however. Republicans are livid over a recent ruling by the National Mediation Board that makes passage of a vote to unionize dependent only on getting more than 50% support from those actually voting. For example, if a company has 1,000 workers but only 200 take part in the vote to unionize, the rule change would mean only 101 “yes” votes were needed for it to pass. Under old rules, more than 50% of all workers eligible to vote — or in this example 501 “yes” votes — would have been required for it to pass. Workers who didn’t cast ballots were counted as having voted “no,” making it more difficult for supporters to succeed. It remains unclear what — if anything — the divided Congress will ultimately do in response to the change. WASHINGTON (AP) — The government is likely to lose more than $1 billion in airline ticket taxes because lawmakers have left town for a month without resolving a partisan standoff over a bill to end the partial shutdown of the Federal Aviation Administration. The government already has lost more than $200 million since airlines are unable to collect taxes on ticket sales because the FAA‘s operating authority has expired. The Senate recessed on Tuesday until September, erasing any possibility for quickly resolving the issue. The House left Monday night. Caught up in the partisan acrimony are nearly 4,000 FAA employees who have been furloughed. The FAA also has issued stop work orders on more than 200 construction projects, threatening the jobs of thousands of other workers. Air traffic controllers, however, remain on the job. The debacle could have had an upside for airline passengers because ticket taxes, which typically average about $30 on a $300 round-trip fare, are suspended during the shutdown. But airlines decided to pocket the windfall. Within hours of the shutdown on July 23, most airlines raised their fares by amounts equivalent to the taxes that disappeared. Transportation Secretary Ray LaHood called airline CEOs to complain and lawmakers have sent letters demanding the fare hikes be reversed and the profits be placed in escrow. But their howls have largely been ignored. Airlines collectively lost about $440 million in the first six months of this year, according to the Air Transport Association. Some passengers will be due tax refunds if they bought their tickets and paid taxes before the shutdown, but their travel took place during the time airlines no longer had authority to collect the money. Airlines and the Internal Revenue Service are quarreling over who will handle the complicated and expensive process of getting those refunds to passengers. LaHood, a former GOP congressman, conveyed the same message in a series of private meetings on Capitol Hill and in phone calls to lawmakers, but was unable to clinch a deal. Sen. Jay Rockefeller, D-W.Va., chairman of the Senate committee that oversees the FAA, held out the possibility that if the Senate were able to pass a bill acceptable to Democrats, it could still be approved by the House using obscure parliamentary procedures, and sent to the White House. But his House counterpart, Rep. John Mica, R-Fla., ruled out that possibility. The only way left to end the shutdown is for the Senate to agree to a previously passed House bill containing $16.5 million cuts in air service subsidies to 13 rural communities that some Democrats — particularly Rockefeller — find objectionable. “The only one holding this up now is Mr. Rockefeller,” Mica said. One of the 13 communities that would lose subsidies is Morgantown, W.Va. The entire air service subsidy program costs about $200 million a year, roughly the amount the government lost in uncollected ticket taxes in the first week of the shutdown. The program was created after airlines were deregulated in 1978 to ensure continued service on less profitable routes to remote communities. But critics say some communities receiving subsidies are within a reasonable driving distance of a hub airport. Subsidies per airline passenger range as high as $3,720 in Ely, Nev., to as low as $9.21 in Thief River Falls, Minn., according to the House Transportation and Infrastructure Committee. Senate Majority Leader Harry Reid, D-Nev., said Republicans were trying to force Democrats to accept policy concessions they would be unable to enact through normal legislative procedures. Democrats tried repeatedly over the past two weeks to pass a bill extending the FAA’s operating authority without the subsidy cuts, but were blocked by Republican senators each time. Underlying the subsidy dispute, was a broader, more politically-charged dispute over a labor provision inserted by House Republicans into a separate, long-term FAA funding bill. The FAA’s last long-term funding bill expired in 2007. Since then, Congress has been unable to agree on a long-term plan. The agency has continued to operate under a series of 20 short-term extensions. Democrats said the air services cuts were being used as leverage to force them to give in to the House on a labor provision, which the White House has said Obama would veto. They see the provision as part of a national effort by Republicans, both in Congress and in state capitals, to undermine organized labor. The provision would overturn a National Mediation Board rule approved last year that allows airline and railroad employees to form a union by a simple majority of those voting. Under the old rule, workers who didn’t vote were treated as “no” votes. Democrats and union officials say the change puts airline and railroad elections under the same democratic rules required for unionizing all other companies. But Republicans complain that the new rule reverses 75 years of precedent to favor labor unions. We Are Wisconsin’s La Crosse headquarters a ‘total loss’ after Saturday morning blaze. The La Crosse Tribune reports that the cause of the fire, which started at about 9:30 a.m., remains unknown. Firefighters thought they had the blaze under control in the afternoon, however, that wasn’t the case and it continued into the evening, the newspaper reported. A spokesman for the group told the La Crosse Tribune that the group’s office was a total loss. In the 32nd District, the group has spent about $400,000 to get Shilling elected, the La Crosse Tribune reported. The group is also active in the 8th Senate District recall race between incumbent Republican Alberta Darling and Democratic challenger Sandy Pasch. In that Milwaukee-area race, We Are Wisconsin has spent at least $570,000 on pro-Pasch ads. Throughout the day Saturday, those active in the recall effort were taking to Twitter and calling the fire “suspicious” since it occurred just 10 days before the recall. However, fire officials haven’t yet determined the cause of the blaze, according to local media reports. Emergency managers — Michigan Gov. Rick Snyder ripped authority from two towns and the Detroit public schools into the hands of individual bureaucrats. Declassifying endangered animals — The federal budget passed this April gave gray wolf hunters the green light. No more bargaining — Legislation passed in Wisconsin and other states busted unions under the guise of a budget crisis. Lowering taxes on cigarettes — New Hampshire is the latest state to consider a measure that purports to stimulate the economy by poaching smokers from other states. Banning composting on Capitol Hill – Saving taxpayers $0.003 each. Signing pledges not to raise taxes – Throwing an ugly wrench into budgeting talks at both the state and federal levels. Selling the wilderness — Republicans used the April budget to defund some wilderness protection programs and continue to push for additional land privatization. Rejecting government money for high-speed rail — Florida rejected more than $2 billion in federal funds that ended up going to more ambitious states. Threatening to withhold emergency-relief funds — Some Republicans said Joplin, MO tornado victims should only be given assistance if the government balanced its spending with funding cuts elsewhere. Ending the federal mohair subsidy — Farmers brought their goats to Capitol Hill in protest, but this arbitrary-sounding $1 million annual subsidy was finally cut in the April budget.